18ft New Age Gecko for hire from Heathcote NSW. Fitted with all the mods cons, easy to tow & set up & sleeps 6 comfortably. It caters for families who want to head off for a cheap, fuss free holiday. Flexible check in/out times or we can even arrange to have the van delivered to a nearby campsite. Your vehicle's manual will state the towing capacity of which you will need a capacity of greater than 2500kg (and 180kg Tow-ball weight) plus equipment included and the items you will put into the caravan of a personal nature. If for some reason you are unable to meet the tow capacity or are unable to tow the caravan, VanGo can transport the caravan to your chosen destination (some restrictions do apply). There is an additional set-up fee of $100 plus $1.50 per kilometre of travel from Heathcote NSW 2233. 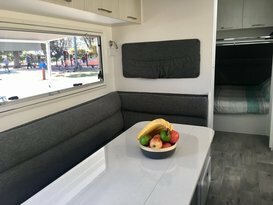 Our New Age Gecko offers apartment style accommodation on wheels. 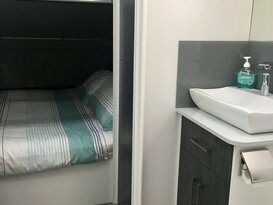 It features modern interiors, reverse cycle air conditioning, 2 x TVs, stereo with indoor & outdoor speakers, queen size bed with full ensuite (separate toilet & shower) and triple bunks for the kids. 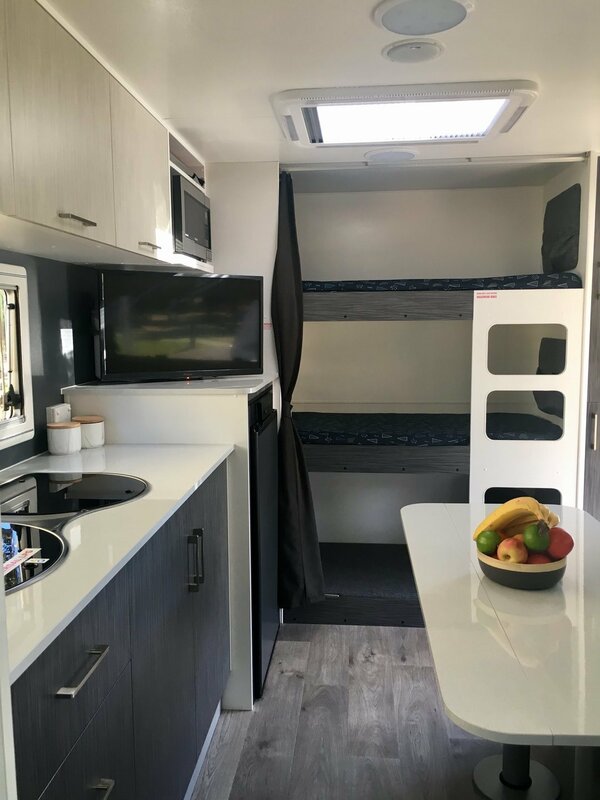 The kitchen is fully equipped with cutlery, plates, pots & pans, basic pantry supplies, a gas stove, microwave , 164L fridge and a spacious lounge dining area that can also be converted to provide a 6th bed. Outside there is external power, TV points, camp table and chairs, pull out BBQ all under a roll out awning. The van is also set up for free camping with solar panels fitted to the roof, 2 x 4.5kg gas bottles and 2 x 80L water tanks. We can also take the van to a location of your choice and set everything up for you for an additional setup fee of $100 plus $1.50 per kilometer traveled. The van must be returned in the clean and tidy state that it was collected. NO smoking at any time please. The van must be returned in the clean and tidy state that it was collected/delivered. Please ensure that the toilet is emptied before returning the caravan. Caravan not to be taken 'off road' or on any 4x4 dirt road tracks. Excellent for families, so clean, so modern, easy to organise, pick up and easy to tow. 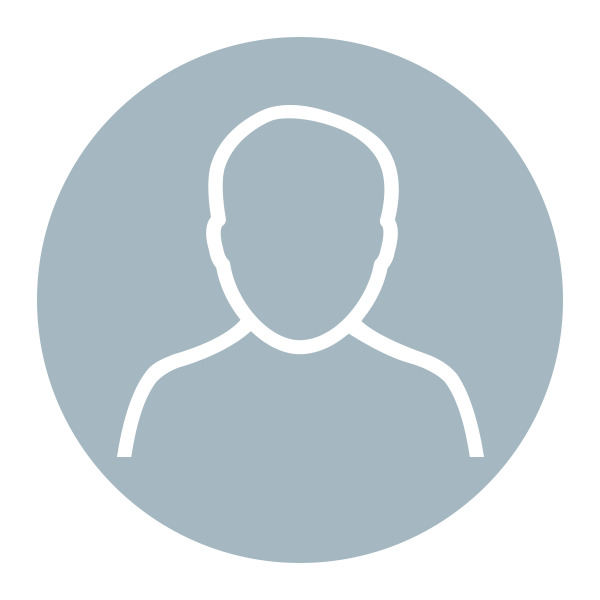 Mark was fantastic to communicate with, flexible, professional service. Definitely booking in 2 more trips with this super fun van. This was our first time using this service. We will definitely use it again. Dealing with Mark and Belinda was hassle free, flexible, we were walked thru the van, shown how it all worked etc. The van towed extremely well and was easy to handle. We stayed in the Gecko and couldn't have asked for a better experience. From the start Vango were very helpful with their information and their customer service was outstanding right until the end. The Gecko was modern and spacious for a family of 5 and had everything we needed for a trip away. It was a very easy experience and holiday and would definitely recommend Vango to other people . We will definitely use them again in the future. Perfect from start to finish. Before we booked Mark and Belinda were very accommodating for us to have a look at the van to make sure it was right for us. Communication throughout the whole process was so easy and they were really quick in getting all the info we needed. The van itself had everything we needed, all we took was food, bedding and clothes. We had a great time and this is a perfect family van. Our two young girls loved the bunks! Couldn't recommend them highly enough. Thank you so much for a great experience. Really great experience with VanGo. Owners were very helpful, let us check out the van before we had the holiday, and the assistance with delivery to site and set up was all too easy. The van itself is modern and has all the mod cons, including a large fridge, air conditioning and gas bbq. Overall a terrific way to enjoy a hassle free camping trip. With 2 small girls, hiring the caravan for our recent trip was the best thing we did. 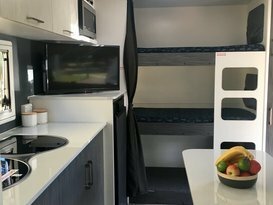 The caravan had all the features we required at our finger tips with everything very simple to use being first time caravaners. Only packing our clothes, bedding, towels & food made our lives that little bit easier. 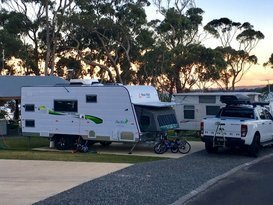 The caravan was clean, spacious and made our holiday stress free and so enjoyable. We’ll be hiring again! Thank you, Dan & Kim. 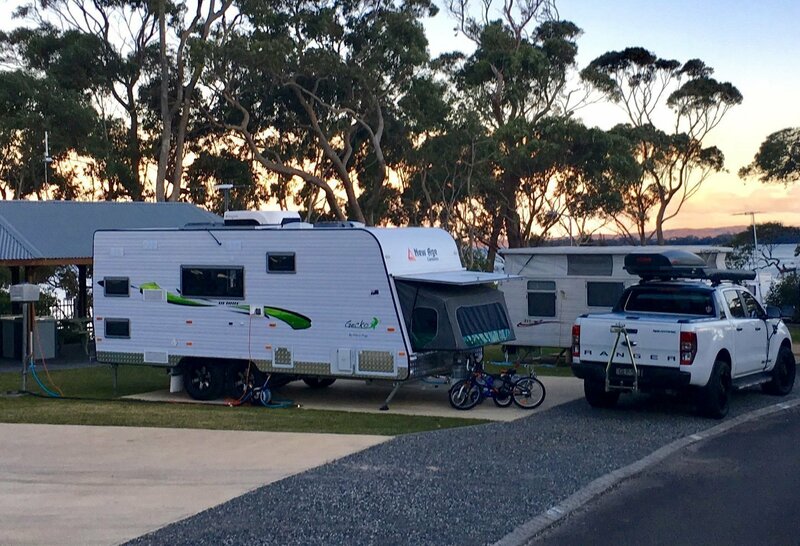 VanGo Caravan Hire is a family owned and operated caravan Hire company located in the Sutherland Shire. Our modern vans cater for families who want to head off for a cheap, fuss free holiday...couples who want to get away from it all...and also the retired who would like to take off in the quieter months outside of schools holidays. If you are unsure about towing a van, we can offer a delivery and pickup service. We can even set up the whole campsite for you and all you need to do is turn up, take the keys and start creating memories. 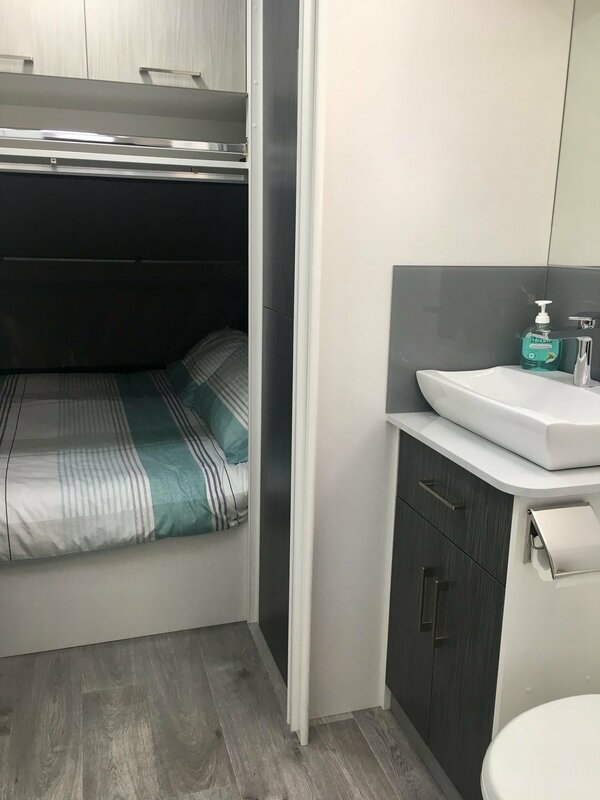 Whether you are looking to get away or want a taste of the caravanning lifestyle... maybe you want to try before you buy, you can do it at your own pace with the freedom of VanGo Caravan Hire!